Disclaimer: I did not pay for my meal, Hub hosted a free media breakfast. The opinions reported below are based solely on my thoughts at the time of my visit. 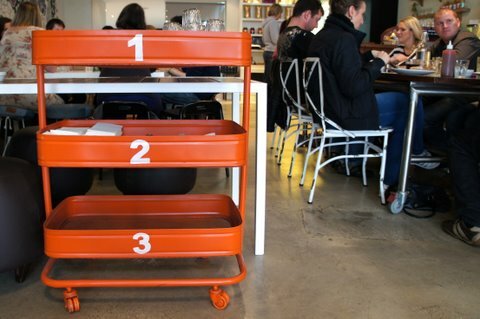 A few weeks ago, Hotel Urban in Saint Kilda opened a new café, aptly named Hub. It’s the perfect spot to fill your energy stores for a day of sightseeing if you’re staying overnight, but it’s also worth checking out if you’re a Melburnian who enjoys a decent feed. 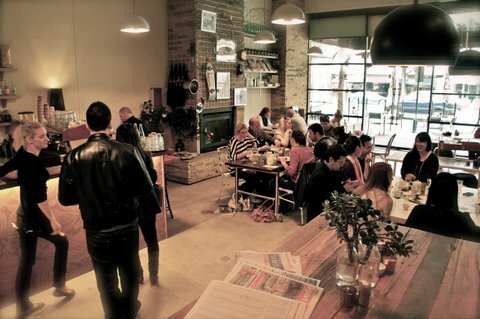 Sit outside under the heaters or pull up a chair at the raised communal table near the back. If you’re lucky you can snag the retro banquette seat built into the wall next to the brick fireplace. The chimney is blanketed with chicken wire and scattered with an interesting mix of objects: a giant fish, a skateboard, a camera, flowers in jars and framed artwork. Hub is quite separate from the hotel and is a touch eccentric. The décor is a mixed bag to say the least, but there’s definitely a 70s vibe lurking there somewhere. 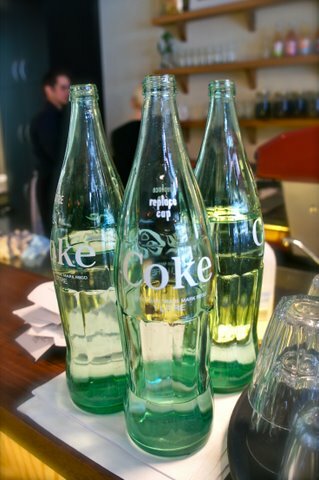 Green Coca-Cola glass bottles are filled with tap water and vintage magazines line the shelves. 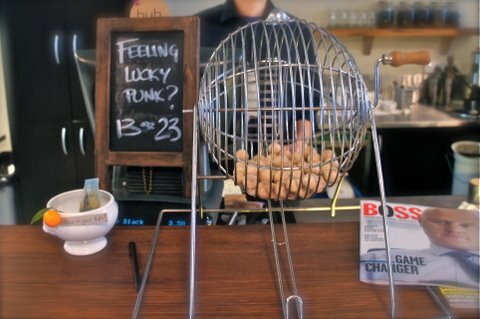 An industrial, burnt orange trolley carries the cutlery, while a bingo cage filled with balls at the counter may just win you a free T-shirt. The coffee is Genovese and will please anyone trying to ‘seize the day’. 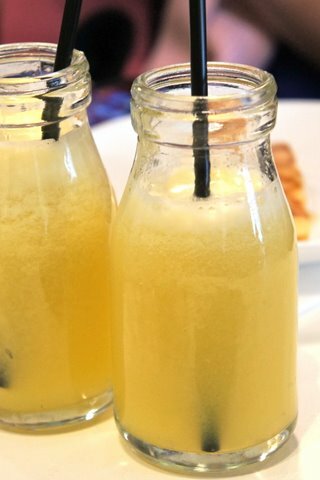 The freshly squeezed juices go down easily and the tea is Larsen and Thompson. There’s even an MOA breakfast beer on offer, which I didn’t feel like at the time but regret not trying! 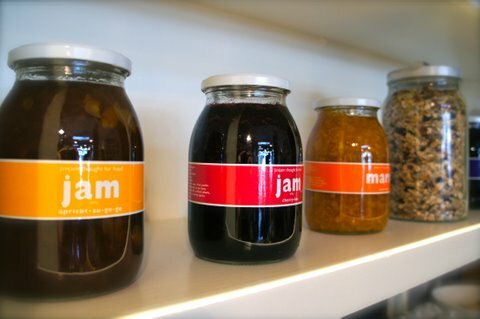 The breakfast menu is divided into ‘The Classics’, ‘Modern Takes’ and ‘Specials’. 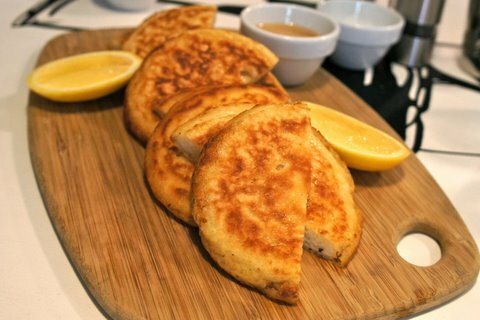 From The Classics column we sampled the house made crumpets with lemon and creamed honey. They were heavy and sweet. If I was eating alone, I would have polished off the cloudy honey with a spoon… or my finger. 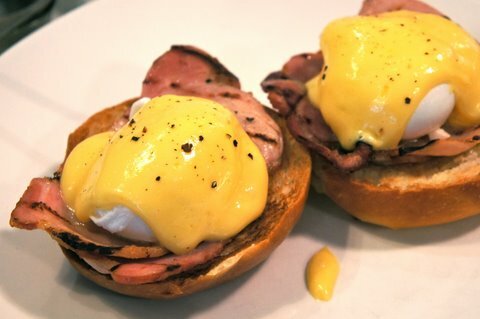 Another ‘Classic’ ordered was the eggs Benedict. It was simple, like the dish should be, but arrived on a fluffy, brioche muffin. There is also the option of ordering your own version of a Big Breakfast, consisting of two eggs on toast, cooked as you wish, wish any three sides. We really took to the ‘Modern Takes’. 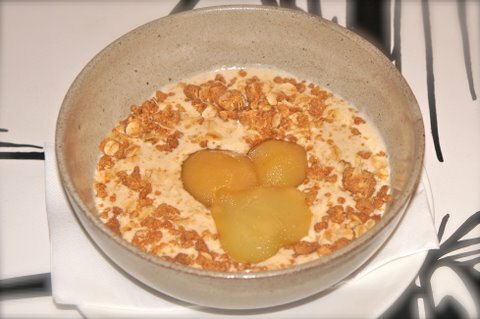 The cinnamon porridge with caramelised pears and oat crumble won points for consistency, the crumble adding a pleasing crunch. 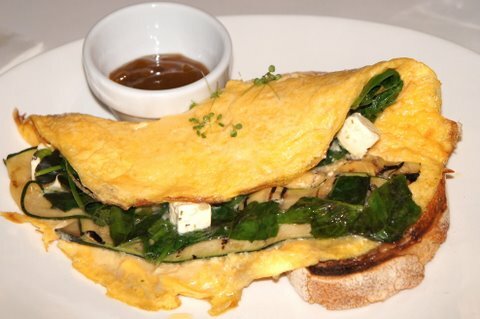 The two omelettes (grilled zucchini, feta, spinach and basil; or chorizo, roast capsicum and potato) were reportedly tasty, even if they weren’t the prettiest meals to photograph. The house cured salmon with soft cooked eggs, salmon caviar and dill on toast sounded divine, but I’ve never been fond of the texture of slow-cooked eggs. 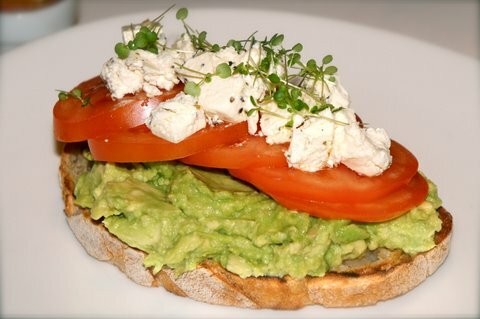 Instead, I opted for the crushed avocado with vine ripened tomato and feta on toast. The thick slice of sourdough toast from Zeally Bay was flawless, but unfortunately the toppings were nothing to write home about. The dish could be improved with some simple tweaks: ditch the temperamental vine ripened tomato for consistently flavoursome cherry or heirloom varieties, add some extra seasoning to the bland avocado mash, and find some feta that is not so, well, lacklustre. That being said, my breakfast was one miss in a bunch of hits. 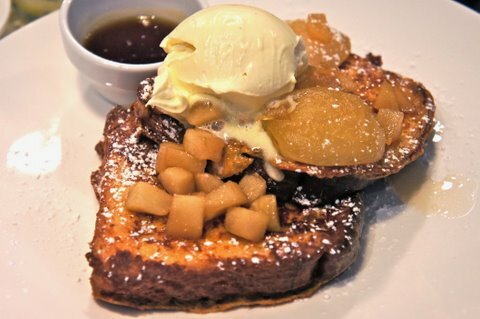 One of the hits was the brioche French toast with caramelised apples and mascarpone cream. Sprinkled with icing sugar and served with a side of maple syrup, it supported my theory that the less healthy the dish at Hub, the more delicious (or is that just a general, foodie rule-of-thumb?). 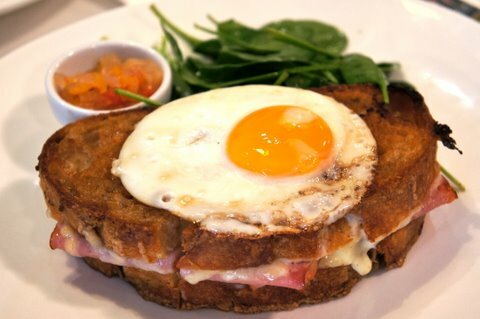 Also sampled from the specials was the Croque Madame: a toasted sandwich with sliced ham, oozy Gruyere cheese and classic béchamel sauce, topped with a fried egg. To prevent you from crawling into a corner and crying with guilt after eating the whole thing, a zesty tomato relish and a side of spinach leaves provided a welcomed illusion of health. Lunch specials included Moroccan spiced carrot and pumpkin soup and a veggie Sheppard’s pie with lentils and vintage cheddar. The scotch fillet steak sandwich, linguine puttanesca, chicken pot pie with leek and mushroom, and the lamb and feta burger served with olive tapenade, minted yoghurt, salad and fries were the other lunch options that caught my eye. To hit that sweet spot, the spiced quince crumble with roast almond ice cream from the dessert specials sounded like the perfect winter warmer, as did the treacle tart with vanilla bean ice cream. 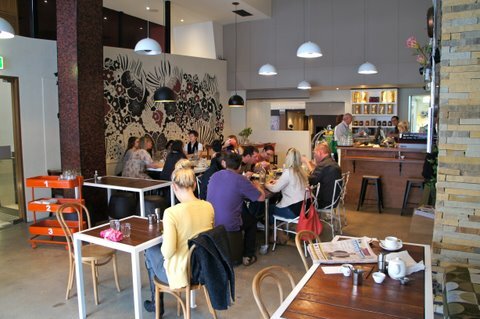 Hub has its processes in place, offers a decent menu and is run by a passionate team. Most importantly, it could stand alone without Hotel Urban weighing down its backside. 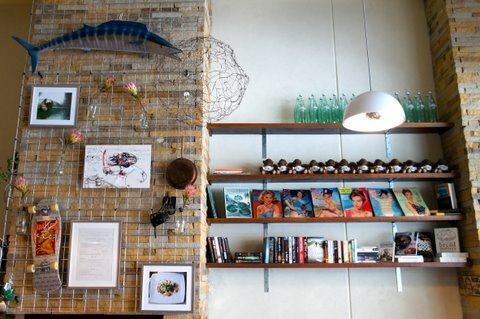 While this quaint and quirky café isn’t revolutionary, Hub has a unique, easy-going personality that is most appealing. Now where’s that breakfast beer?